I'm painting two almost same Thangkas in a different way of coloring. 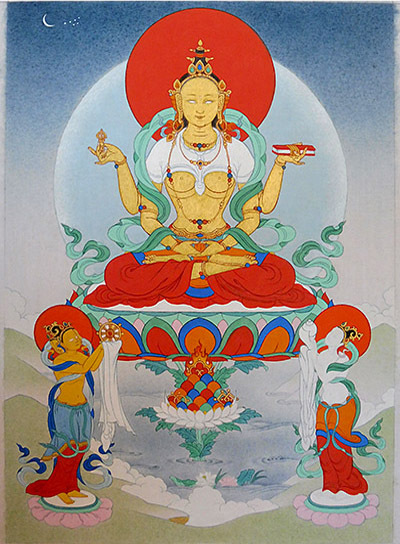 Painting as normal full color Thangkas with the base color layer, and painting with "Washes" without initial color layer. The first one painted in usual coloring process with initial layer. The lining on the initial color layer and few parts of shading are done in the image. Here are two of my recent works. Both are Thangka of same deities in the same composition. 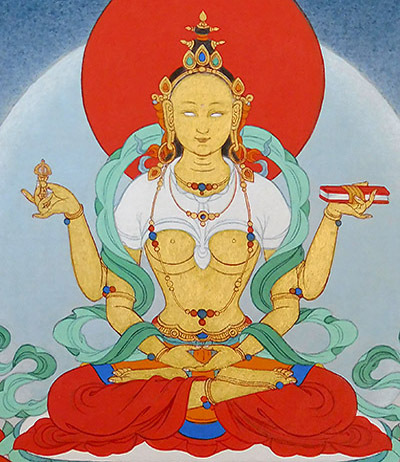 Yum-Chenmo(Prajnaparamita) with Gyajin(Indra) and Brahma(Tsangpa). The difference is the way they will be painted. 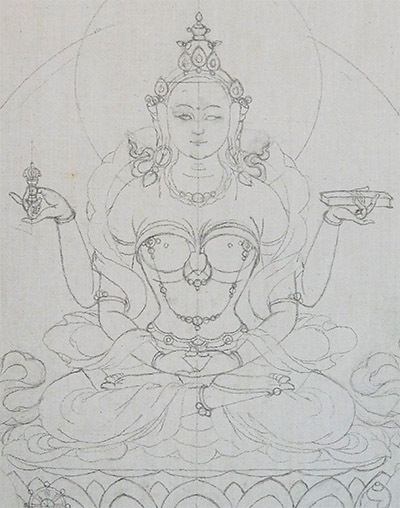 One of them will be painted in the same way often used to paint "Tsagli", Tibetan initiation card. 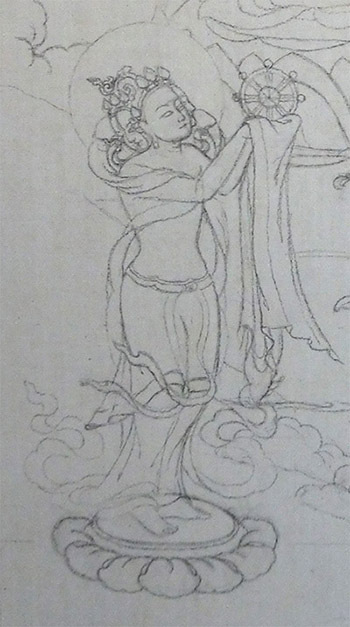 Compare to the usual Thangka, there will not be the initial coat before make shading. Most of the shading will be done directly on the canvas. 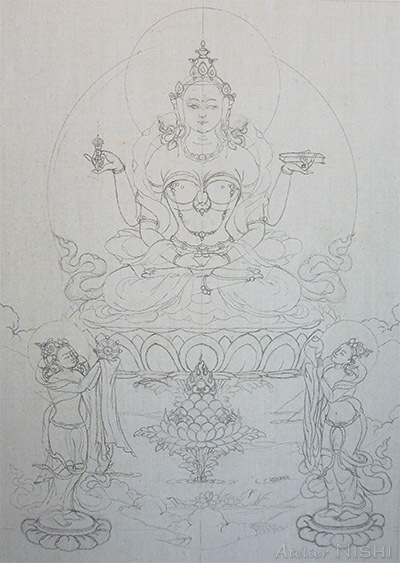 Both Thangkas will be painted with natural pigments and dyes. Canvas was ready for this time so the first step is drawing. Yum-Chenmo is a female deity with one face four arms. Brahma on the left, offering "the Dharma Wheel". Indra offering "the White Conch Shell". It's been a while since the last post. 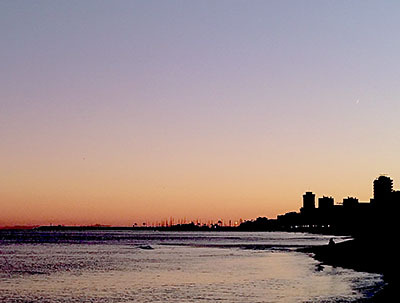 Here is an update from beautiful sunset Malaga. I have been really busy trying to finish my recent work before the end of 2017. On top of that, my camera suddenly showed "Error" sign and had to send to repair. Now that I've finished my new painting after months of work and the camera is back from repairing, here is a report about the new painting of lotus pond "Dewa-chen". 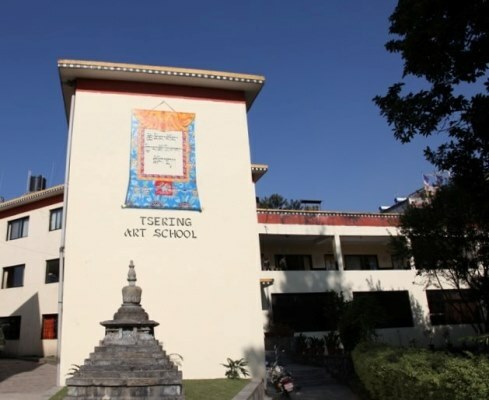 The theme is Sukhavati or Dewa-chen in Tibetan. 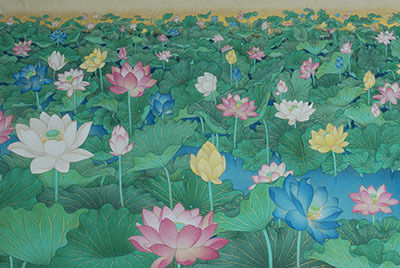 The beautiful landscape of the western pure land covered with lotus flowers of different colors. Red, blue, yellow white, crimson. The leaves are full of vitality, none are withered, all are perfect.